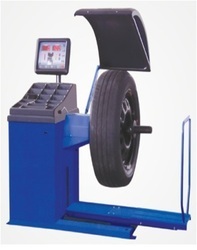 We are a leading Exporter of computerized wheel balancer with 1 gm accuracy, heavy duty wheel balancer, computerized wheel balancer and wheel balancer from Mumbai, India. 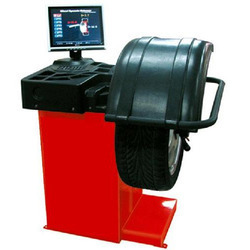 · Large Cabinet — Heavy Duty Design — Suitable for medium to large volume Tyre shops/Garages. · 16 inch High Resolution Video graphic Wide Screen LCD Display. · Possibility of writing one's name or a message on the initial screen. · Possibility of varying Tolerance function from 1-10gm. · Possibility of unbalance display in 1gm to 5gm. · Measurement for Two Plane as well as single plane. · 4 Alloy Rim Program ALU1, ALU2, ALU3, ALU4. · Operational Error code display. · Automatic Stop Mechanism after measurement cycle — Electronic DC Injection Braking. · Brake Pedal for accurate positioning of counter weights. · Automatic Entry of Distance and Diameter parameter. Looking for Computerized Wheel Balancer ?